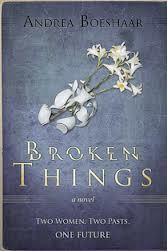 Broken Things, re-released by Lighthouse Publishing of the Carolinas, is an unusual romance novel by Andrea Boeshaar, that looks at the choices of Allie Littenberg and Jack Callahan. Both were in love long ago in Chicago but separations and miscommunication led to them never reuniting. Well, at least until Allie returns to Chicago for a consulting job and decides to look up her former love. She’s a widow now with one son who is in ministry and married. She’s hopes repair some bridges that may have been burned by her choice to leave. Jack Callahan is not happy to see his former girlfriend, the woman he had wanted most to marry. Sure he had eventually married, but his wife had left and was dead and he had to raise their son. Wounded and broken by life, this cop had abandoned God and would like to keep it that way if his son and now Allie would leave Him out of the equation. Allie is hurt by Jack’s refusal but understands it, so she steps back and does her job which leads her to taking on abuses at the nursing home she is working for. The woman she found being abused is dying and has no family interested. So Allie pours her time and heart into ministering to this broken woman on the verge of eternity. Andrea does a beautiful job weaving in the emotional turmoil of the characters in her book. As Jack struggles with his conflicted feelings towards Allie, he’s forced to confront his anger towards God and own up to his past mistakes along the way. How this all blends together is beautiful. Broken people can be used by God and God never gives up on those who have been broken and living apart from Him. He always stands ready and waiting with open arms. He is the master of fixing broken things (aka hearts).